Couple discrimination – Censor This! Filed under Wanna Hear Something Weird? 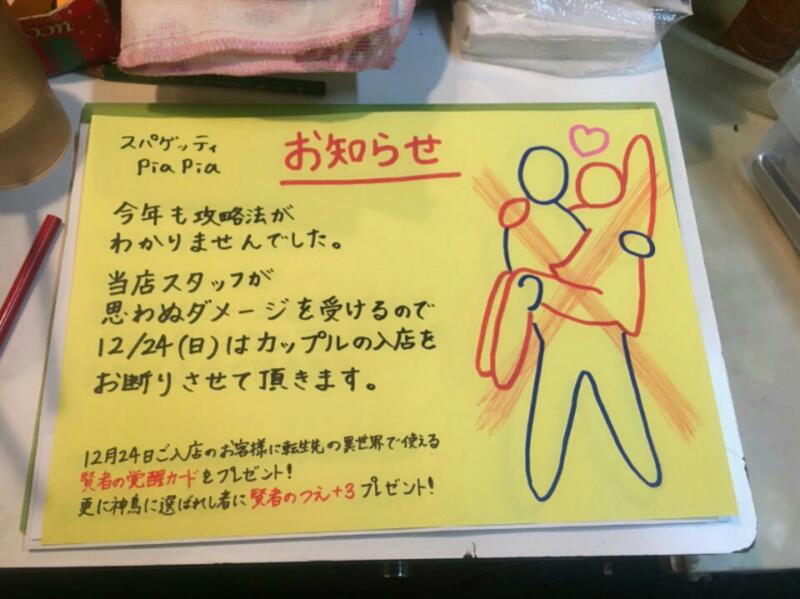 Pia Pia, an Italian restaurant located in Tokyo bans “romantic couples” from dining there on Christmas Eve. Possibly a poor move for their business, or maybe other food chains need to catch on? The Holidays are for spending time with loved ones. So undoubtedly couples would want to spend every waking moment together celebrating. Sadly everyone’s Holidays can’t be filled with romance. So Pia Pia acknowledges the pain people are caused by being single on yet another joyful holiday. Just weeks before Christmas Eve 2017 a large sign showed up in the restaurants window, a man holding his romantic partner is shown with a large red “X” crossed over them. Next to the image the restaurant harshly stated that they will not be serving couples on Christmas Eve with “NO EXCEPTIONS”. Couples felt excluded and discriminated at first, but looking at a larger picture this “anti-couple” Christmas Eve isn’t much different then the couple free valentines day restaurants. Even though Christmas isn’t designated for couples it’s still a Holliday people want to enjoy free of couples flaunting their love in front of them. This restaurant provided a safe place for people to enjoy their dinner without unnecessary stress. To support their reasoning for excluding couples that they gives employees and visitors “sever emotional trauma”. That seeing happy couples on Christmas Eve impairs ones ability to work to the best of their ability. That the quality of the meal is being decreased because of excessive love. It may seem preposterous, like possibly the owner is doing this against the best interest of the restaurant. Looking deeper into peoples opinions though, it’s common for people to want to have a meal with friends or family. The restaurant’s publicity hasn’t dropped since there obscure choice, and the business is not planning to be open to couples next year either.